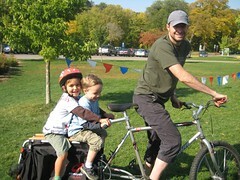 My xtracycle is now a functional single-speed bicycle, fun to ride, and my new preferred way to transport children. It also makes a great conversation starter with not-bike people. This new rig is built up with bits from every bicycle I've had in the last 8 years. Makes a good advert for not aggressively purging the parts bin.